On Sunday, October 14, 2018, Ronald Davis Pamperl, loving husband and father, entered eternal rest at the age of 96. Ronald was born on July 30, 1922 in New Boston, Missouri to Olive and George Pamperl. His life reflected the qualities of a man adored by the people whose lives he touched. He was courageous. He served in the U.S. Army Artillery during the European Campaign of World War II; valiantly landing on the beaches of Normandy and surviving the Battle of the Bulge, he fought to liberate Europe and secure the freedoms we enjoy as Americans. He was part of a great love story. After WWII ended he married his sweetheart who waited for him at home. They both worked as he completed his college education at the University of Missouri. During this time he was again called to serve during the Korean War reaching the rank of Second Lieutenant. His railroad career spanned 30 years beginning as an assistant civil engineer for the Wabash Railroad and ending in retirement as an expert in railroad crossing safety throughout the U.S. and Canada for the Norfolk Southern Railroad. Ronald took his athletic skills as a high school championship basketball player and applied them to the other sports of fishing, bowling, and golf. A favorite pastime was woodworking. He could fix anything. Ron and Dorothy raised two children and always spoke in great gratitude of their long happy life together. He was a man of faith, and an active member of Oakwood Forest Christian Church, serving as a deacon and helping to take care of the church grounds. He expressed his love for his family, and those around him through his many acts of service. He will always be remembered for his positive attitude, infectious smile and laugh, and his love for dogs. Most of all, he will be remembered for his devoted love for his wife of nearly 72 years. As written in I Corinthians 13:8, "Love never Ends." He was preceded in death by his mother, Olive Slaughter; and father, George Pamperl; and his faithful dog, Joy Lee. Ronald is survived by his wife, Dorothy Jean Pamperl; son, Ronald Wayne Pamperl and wife Sandra; daughter, Pamela Jean Churn and husband Cal; grandchildren, Ashley English and husband Warren, Curtis Churn; and great-grandchildren, Logan Brooke English and Landry Blaire English. Special thanks to the staff at Governor's Bend Assisted Living, Amedysis Hospice, Ballad Hospice, and the staff at Holston Valley Medical Center. The family will receive friends from 12 to 2 p.m. on Wednesday, October 17, 2018, at Hamlett-Dobson Funeral Home, Kingsport. 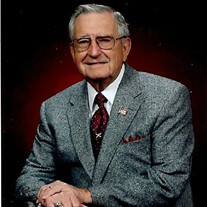 The funeral service will follow at 2 p.m. with Marlin Jaynes, Minister, officiating. Burial will follow at Oak Hill Memorial Park with Military Rites by American Legion Posts 3/265.